The first emblem used the coconut tree as a prominent symbol. 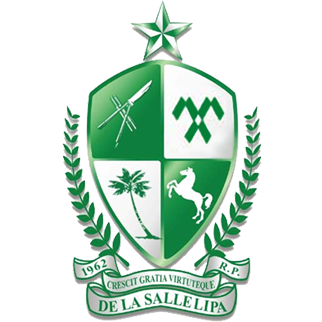 The picture above shows the first De La Salle Lipa emblem worn by students on their left breast pockets when the school first opened in 1962. Of this I am certain because I have seen pictures of this emblem in the school yearbook still called Sabre at the time. Then, it was probably appropriate to use the coconut tree to represent the school symbolically because the entire campus sat on what used to be a coconut grove. Most of the trees either died out or had to be cut down to make way for campus development, particularly in the second half of the nineties. When I first enrolled at DLSL in 1969, the emblem that we wore on our pockets was a variant of the one above. I do not recall exactly how ours was different; but I am pretty certain it was not exactly as shown in the picture. Note the motto “Crescit Virtute Scientiaque.” I do not speak a word of Latin; but what the heck, there is Google Translate. It says, “Increases the power of knowledge.” Being Google Translate, I am sure something was lost in translation; but we all get the gist of it. 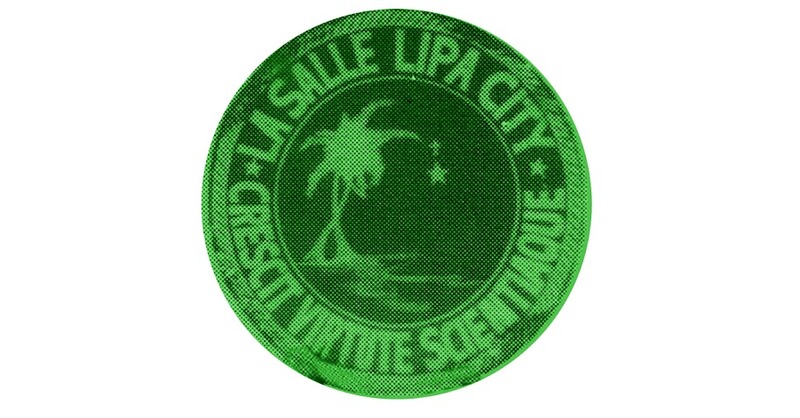 The seal above was used from the early seventies to the turn of the millennium. This one above ought to be very familiar to many alumni and alumnae because it was used from 1971 or thereabouts to roughly 2003 or 2004. I have this vague memory of my mother being upset (because of the expenses) that we had to change emblems twice in two or three years; so there must have been minor tweak before the design above became permanent for the next three decades. I asked the late Br. Rafael Donato about this emblem, which was first used during his term as Principal in the late sixties, when he was my boss in the nineties; and he told me that he had asked a Br. Sixto to design it for him. Do not take this as historical fact because I have never met this Br. Sixto nor asked him to corroborate this, although I have seen pictures of him in the yearbooks. This was not just an emblem but a proper coat of arms. Most of the elements are easy enough to understand as symbols of the Batangueños: the balisong (a Batangueño fan knife), Taal Volcano, the Lasallian star and, of course, the coconut tree which I previously explained. I never did quite get the use of horses, though; and I used to get annoyed when the word Stallions was used as a moniker to describe our teams. This was never really officially declared as so. At any rate, Br. Rafael used to love saying to people that Batangas was known for “fast horses and even faster women.” I was born and raised in Batangas, and it was never as though horses were running all over the place like in a Marlboro commercial. On the other hand, whoever argued with Br. Rafael? Wink. Note that the motto had changed to “Crescit Gratia Virtuteque.” Google Translate says, “Increases the grace and power.” The venerable Mr. Mauricio Lingao, who many alumni and alumnae will remember, once translated this as “He grew in grace and virtue.” He used to be a seminarian, so we will take his word rather than Google’s. Finally, to the present incarnation of the school emblem, as seen in the picture above. It is actually the same as the previous emblem in terms of elements, but tweaked to give it a more contemporary look. The redesign was done by Ms. Lorna Achico, who at the time worked under my office as Publications Officer. While I loved the previous emblem, it never looked well scaled down for computer publications. By 2003, Br. Rafael had retired from active service and was replaced by Br. Manuel Pajarillo. I am not sure not if it was in 2003 or the year after when a review of the school’s mission statement was undertaken. What I am sure of is that we timed the redesign of the emblem to coincide with the review of the mission statement so that it could also be critiqued and approved by the same group that was doing the review. There were two new elements to the coat of arms. The broken chevrons, which have taken the place of Taal Volcano, symbolise the broken legs sustained by a warrior who fought so that the Moors might be expelled from Europe in the 9th century, paving the way for the re-establishment of the Episcopal See. At least, this is how the school’s official site explains the chevron as I never fully understood what it stands for until I visited the web site recently for this article. Finally, the laurel leaves were added not really to symbolise anything significant but really more for aesthetic purposes. That said, the laurel leaf is the universal symbol of victory, anyway.